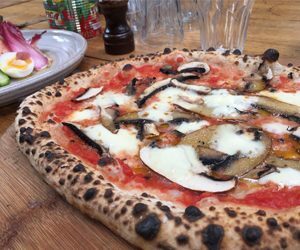 Food / Manchester, Britain’s new gourmet city. The city of Manchester is by all accounts most famous for a few sporting teams. Most visitors over the years would have found their way to either Old Trafford or Maine Road or now the new impressive Etihad Stadium. 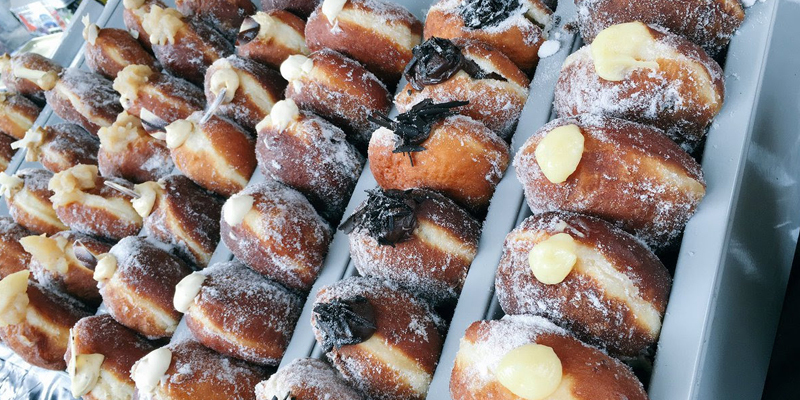 The Airline Reviewer John Nielsen spent a nice weekend soaking up the gourmet delights. Had I mentioned local gourmet food or brilliant food markets, thoughts would have turned to the more traditional fare of fish & chips, the classic meat pie or even a chip butty with a cup of tea! Much has changed over the years as Manchester, after the Arndale bombing in 1996, underwent major changes on many levels. The Manchester Rejuvenation Plan has breathed new life into one of England’s biggest and oldest cities. Rich in history, the city has become a great place to visit and explore, with marvellous dining to be had and world class soccer to see. I have spent many holidays in Manchester visiting friends and a certain team in light blue, but on my first return in 15 years, I was in awe how much the city has changed for the better and how Greater Manchester has somehow gone back to being young and hip. 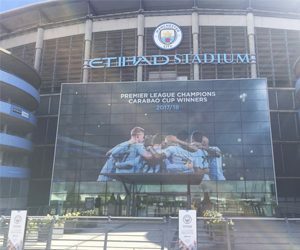 The development of Manchester has a number of elements: from the obvious huge investment the city undertook by hosting the Commonwealth games in 2002, then the purchase & investment by the Abu Dhabi-based owners of the soccer team, Manchester City. In 2003, the old Maine Road stadium at Moss Side was demolished and replaced by a new housing development, allowing for the move to the amazing City of Manchester stadium complex. As with much in life, it’s people who make things happen. Those who’ve played an important part in Manchester’s regeneration include the former chair of Marketing Manchester and owner of the property company Urban Splash, Nick Johnson. Nick grew up with a father who was the owner of a Real Estate agency and a property developer, so he learnt the ropes of the business from early on. After working in the more traditional corporate space, Nick had an opportunity to consult on a project in his home suburb of Altrincham, where the local market was facing tough times. As the project developed, Nick said he felt a strong bond and believed it was a project he could get involved in. 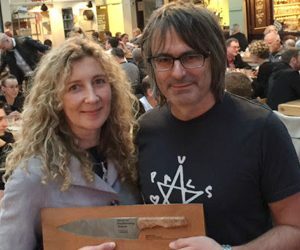 His love of good food and local produce led Nick and his wife Jan to rejuvenate the ailing Altrincham Market and bring a new lease of life to the lovely old building and village square. Through smart placements and a careful selection of local British handcrafted boutique food, coffee, arts & craft producers and a key to the success “no expensive legal agreements” traders were attracted to the concept that combines ideal elements of hospitality! (WHAT!!!) Nick explained that sole traders can’t afford to employ expensive lawyers, who often only complicate business objectives. “We have agreements in place on a hand-shake”, says Nick, “that lay down common objectives and vision. It’s all about quality and growth as a team – I employ the service teams ensuring we can turn over the tables, so the traders focus on their core skills of producing great food & beverages”. It was a busy Saturday morning when I visited. The 20-plus stalls were busy selling fabulous goods: artisan breads and coffee, wood-baked sourdough pizzas, local cheeses, plus arts and crafts. Meanwhile, diners were enjoying food in the main hall on large shared tables. The market concept is clearly getting noticed: The Guardian newspaper praised “Greater Manchester’s biggest food story”, saying it was “unfolding not in the city centre, but eight miles down the road in Altrincham”. As other local councils saw the success it had brought to this area, similar initiatives for us to explore appeared elsewhere in Manchester. At a time of ever more online shopping and challenges, Altrincham’s small retailers actually found their business increasing. The second project is located in the heart of Manchester, in a building called Mackie Mayor, a former meat market, but for years empty and almost derelict. The opportunity was too good to miss: a beautiful building in a great location and full of heritage. 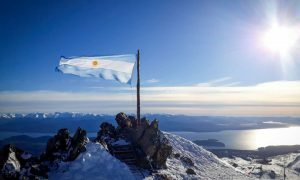 The size of the project and opportunity meant taking the concept and business to another level, while still focusing on the basics. After many months of work and sourcing new boutique traders, Mackie Mayor was opened. 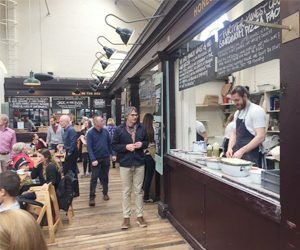 Customers quickly flocked to enjoy an array of the delicious food, with local traders producing their own distinctive high quality home-cooked food. 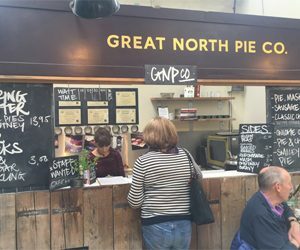 On any busy day, between 2 and 3 thousand customers pass by here before or after a big game at Old Trafford, meeting to soak up the atmosphere and enjoy local flavours from Northern England. “We have so much great produce to offer from areas such as the Lake District and Lancashire and helping these small businesses grow gives a new meaning to life”, says Nick. My lunch at Mackie Mayor was a traditional English roast beef, just brilliantly served up from the Tender Cow stall. 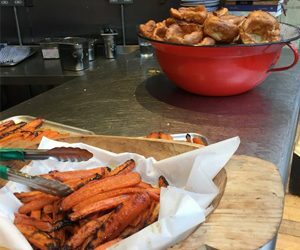 The enticing glazed carrots and Yorkshire pudding took my tastebuds back to my mother’s home cooking. (Maybe even better…. but don’t tell my mum!) 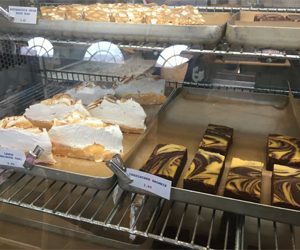 My sweet tooth got the better of me with a slice of lemon pie from Wolfhouse Bakery and a nice coffee to match the delights. Value: It’s clearly a successful concept, judging by the number of visitors and being nominated by the food press as one of the top 10 places to eat breakfast in the UK! Overall value is good. It’s not easy to serve up great quality food while keeping prices down. Both markets have a great rustic feel. Small dogs are welcome, so they’ll also agree! Getting there: Public transport is no problem, as the markets are in the centre of both Manchester and Altrincham. You could actually have breakfast at Mackie Mayor, then jump on the bus and arrive well in time for lunch! If you have time and like football, I suggest you also take a tour of the two stadiums; but book well in advance. The tour gives you a great insight into what makes the two Manchester clubs so big, leaders on the world football stage. It’s also well worth taking a city tour to fully understand the re-development of the city and the new and fascinating buildings that have popped up. Walk along the inner-city canals and imagine a time when local wool mills would use barges as their mode of transport into the industrial city. Nick tells me that during a recent city project, they re-opened some of the canals and established parks and paths for locals to walk along. Located 14km from the city centre, Manchester airport is served by most leading international airlines, with easy train, bus and car access, and plenty of good hotels to stay at. There’s a Holiday Inn right next door to the Mackie Mayor. 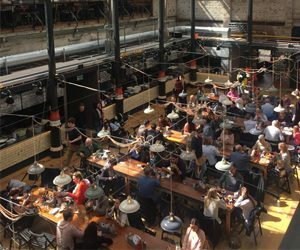 If you are inspired by the “food market” concept, then head to Mercado in Antwerp, Paper Island and the old Meat Markets in Copenhagen, even the huge new Time Out market in Lisbon. All are excellent and worth a visit, but look out also for Nick Johnson’s new venture in the town of Macclesfield, Cheshire at the former cinema space “Picturedrome”, which first opened its doors in 1911. The Food Hall is targeted for July 2019.